We all have a stubborn muscle group that won’t respond to any of the typical bodybuilding methods. Your biceps have been underdeveloped for years, even though you’ve tried everything from heavy weight training to high-rep sets to failure. But no matter what you do, you just can’t get the damn things to grow. For 18 years it’s been my passion to help people add new mass to their most underdeveloped muscles. As a professional trainer, I’m well aware of all the mainstream bodybuilding approaches, and I’ve also learned that virtually none of them work for someone with average genetics. This is also the reason why subpar athletes make the best coaches. Genetically gifted athletes like Bo Jackson were born with all the physical tools to take them to the highest level of performance. Bo, in particular, is a guy that didn’t even need to practice – that’s much natural athleticism he was born with. But the guys who had to sweat, bleed and cuss their way to top also had to learn all the tricks of the trade. Those hard-knock lessons through relentless experimentation are what make them such effective coaches. Most professional bodybuilders are at the opposite end of that spectrum. Sure, they work very hard but it doesn’t take much of a stimulus for them to grow any muscle group. In other words, most training methods don’t work for you but almost everything works for them. 1. Virtually every muscle group requires a unique approach: When I first started training I discovered effective ways to build mass in the quadriceps. But when I applied those same training parameters to the biceps, nothing happened. Each muscle requires a specific set of training parameters. 2. You must spare the joints: You don’t need to add more sets or reps to a workout in order to trigger growth in an undeveloped muscle. If that were the case, 50 sets of curls would result in noticeable gains the next day. There’s a limit to how much growth you can stimulate in any given workout. If you train beyond that threshold you’re creating excessive fatigue and overloading the recovery system. More importantly, adding a bunch of extra sets to your workout for a specific muscle group will wear down your joints. To stimulate new muscle growth, you must train it more frequently – that’s true. But the only way to pull off that trick is by overloading the muscle more than the joint it crosses. 3. Stimulate the largest motor units when they’re fresh: The science of motor unit recruitment is pretty well understood. If you start a set without fatigue, you have the ability to immediately recruit the largest motor units that have the most potential for growth. However, the typical bodybuilding approach doesn’t follow the science. Those sets start out slow and easy and only become difficult at the very end. The neuroscience research shows that the largest motor units with the most growth potential only come into play when you can achieve the highest levels of force – at the beginning of a set. So when a client comes to me to add new mass to an undeveloped muscle group, I keep those three points in mind. In 2012 I released the High Frequency Training (HFT) system, based on all the research and data I’d accumulated. The approach was pretty straightforward: you would choose an exercise such as the pull-up and do a total number of reps per say (e.g., 50) regardless of how many sets it took. Then you would add a rep to that total each day and continue for 6-8 weeks. That approach works well for most muscle groups, but it does little for muscles such as the biceps. Since the original HFT came out I’ve accumulated a ton of data and feedback from the people that followed the program. This info was paired with the constant experimentation I was doing with my own clients. I had to find unique ways to add mass to my clients because all of the typical methods didn’t work. That’s why they hired me in the first place. Now I have new, novel ways to stimulate growth in any muscle group, no matter how stubborn it is. One of my most effective methods is an iso-squeeze countdown that I outlined a few weeks ago. However, that countdown method needs to be modified, based on the muscle that’s being targeted. Let’s take the biceps, for example. If you apply the same iso-squeeze countdown parameters to the biceps as you do for the quadriceps, you won’t experience any gains. The biceps will only get bigger with high-tension exercises that overload the largest motor units. That’s why gymnasts who do the rings have incredible biceps and collegiate rowers don’t. In order to build bigger biceps I use three unique training strategies. One of those three is the 3-1 Iso-Squeeze Countdown, but it only works for certain moves that target the biceps a specific way. I’ve had great success with the narrow, overhand grip inverted row to add mass to the biceps and often underdeveloped brachialis. In my blog last week I mentioned that I’ll be covering some of the ways HFT2 – coming June 24 – will be better than the original HFT system I created in 2012. So today I’m going to briefly describe one of the most popular muscle growth triggers I’ve been experimenting with over the last year. When it comes to building muscle, isometrics have gotten a bad rap. But they will definitely add muscle when you do them correctly and at the right time. If you haven’t experienced appreciable muscle-building results from isometrics it’s probably due to one or two reasons. First, you did them when you were already fatigued, such as the end of a set. This drastically limits the number of motor units you can recruit – especially the largest motor units. Second, you probably added them on top of what you’re already doing in your workouts. But there’s only so much growth you can trigger in one workout – and it’s not much – so adding more volume to a single workout is rarely going to work. 1. It produces the highest levels of muscle tension: To stimulate the most growth, you need the highest levels of muscle tension. If you were involved in a scientific lab study that measured your maximum strength, the scientists would most likely have you perform a maximal isometric contraction against an immovable object in order to see how much force your muscle could produce. Scientists use isometric tests in studies because they know it’s the best way to measure a maximum voluntary contraction (MVC). Put another way, a MVC is measure of your highest level of muscle tension. Importantly, the highest levels of tension coincide with the highest levels of motor unit recruitment. More tension equates to a stronger growth stimulus. 2. Increases cortico-motor excitability more than regular reps do: Your brain has a motor cortex region that correlates with each area of your body, known as a homunculus. 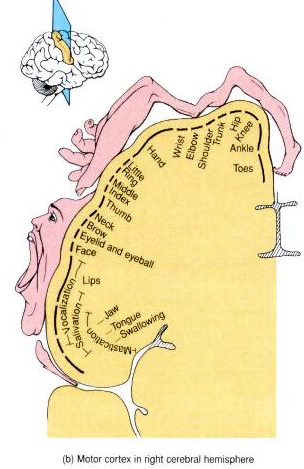 Your hands and face represent a big portion of that homunculus, but many of the muscles you’re trying to build represent only a small region. This means it’s tougher to fully engage certain muscles because your brain doesn’t devote much space to it – unless you practice tensing that muscle frequently. One reason why beginners rarely feel their glutes firing is because the area of the motor cortex devoted to the glutes (hip) is very small. Chris Powers, Ph.D., has performed more lab research on the glutes than anyone I know. In the first few weeks of his protocol he has clients perform long-duration isometric holds for the glutes because his research has shown that it improves the brain’s ability to turn on the glutes, and improve cortico-motor excitability, better than regular contractions do. In order to grow a muscle group, you must be able to achieve the highest level of tension in that muscle. Intense isometric contractions are an excellent way to develop the neural link between your brain and the muscles being trained. Enhancing this descending neural drive is crucial for hypertrophy. 3. Less stressful to the joints: The point of High Frequency Training (HFT) is pretty obvious – train a muscle more often to make it grow faster. However, if you double or triple your training frequency with typically barbell and dumbbell exercises you quickly run into a wall that’s built of fatigue and joint strain. Think of the bench press. When you perform a full range of motion rep, it puts much more stress on the connective tissue of the shoulder joints, mainly at the bottom of the movement. Adding more bench press sessions to your current routine can literally be a pain. This is where isometrics fit in perfectly. When you follow the techniques I lay out in HFT2, you’ll maximally stimulate the pecs without putting excess strain on the shoulder joints. It’s taken me years to figure of the best ways to stimulate muscles more often without wearing the joints down. Other times, however, a terrific way to stimulate growth is with body weight exercises that combine isometric “squeezes” with full range of motion reps. Here’s a quick preview of one technique in HFT2 that shows what I’m talking about. You’ll notice that the longest squeeze (5s in the above video) is performed at the beginning of the set when the muscles aren’t fatigued. Subsequent isometric squeezes shorten in duration as the set proceeds to coincide with the escalating level of muscle fatigue. These type of sets became very popular with my clients for two reasons. First, if you perform each squeeze with 100% effort, you only need one set to stimulate growth. Second, since most of the exercises that use the squeeze-countdown are body weight moves, you can do them anywhere. And a key to success with HFT2 is having the luxury of triggering muscle growth anywhere, anytime. Add the squeeze-countdown push-up technique into your current training schedule, either on a day you don’t train the chest or at least 6 hours away from your chest training workout. Start with 3 times per week, spread out as evenly as possible (e.g., M-W-F) and add a fourth session the following week. This, in addition to your current routine, should double or triple your training frequency for the pecs. And that’s how you make them grow! On June 24, the much-anticipated follow-up to my original High Frequency Training (HFT) program will be released. So over the course of the next month, I wanted to give you all a general overview of some of the programming strategies that make HFT2 much more powerful than the original. One exercise combination that has become particularly popular with my clients since the original HFT is the single-leg squat paired with the one-arm push-up. There are two reasons why. 1. You can do it anywhere: Since neither exercise requires additional load so you can do it anywhere: home, hotel or at the park with your kids. I didn’t include a one-arm push-up in the first HFT, and the way I recommend most people perform a single-leg squat is different in HFT2. We all know the importance of “core training,” regardless of how unclear that term has become over the years. And we know that strong, powerful glutes are essential for peak performance and aesthetic appeal. What you might not know, however, is that training the abs and glutes separately in isolation will do little to improve your performance and overall results. “Ab training without hip strength training is useless,” says Chris Powers, Ph.D., one of the world’s foremost researchers on the complex interplay between the two. Dr. Powers also feels “the true core is the pelvis.” Indeed, the pelvis is the foundation of performance because when it’s out of line, it can have far-reaching effects from your feet to your neck.